Centrifuges have been used in the dairy industry since the 19th century. Today, mechanical separation technology is used in various processes. In the manufacture of lactose and casein, it is the solids that are the valuable products which should be obtained as dry as possible. Decanters are the optimum solution when it comes to producing lactose and casein. They are capable of continuously separating suspensions with a high solid content and liquids. The liquid phase is optimally clarified in this case, while the solid phase is dewatered as effectively as possible. In the manufacture of casein and lactose, it is not just the residual moisture of the solid and the clarity of the liquid that are decisive. The decanter’s suitability for efficient cleaning (CIP), high reliability and availability are also important. In our decanters, we have given particular consideration to the requirements of the dairy industry. Decanters are available in three sizes for use in dairies, and are adapted to the specific requirements of manufacturing lactose and casein. Flottweg clarifier separators for dust removal from whey supplement the range of centrifuges for dairy applications. The clarified liquid phase is output under pressure from the bowl via an adjustable impeller in the closed system. The advantages of this technology are clear: Flexible balance between maximum total dry solids and purity of the centrate. The housing and rotor design corresponds to the requirements of a CIP-capable machine. Numerous spray nozzles for cleaning the housing and scroll body facilitate ease of cleaning. The seals which come into contact with the product are made of an FDA-compliant material. All parts exposed to wear are protected by a special coating. In addition to the protective properties, this also provides resistance against the usual CIP fluids. The efficient Flottweg oil/air lubrication ensures that the bowl bearings are optimally supplied with fresh, high-quality lubricating oil. This means that the bearings maintain a minimum temperature and achieve maximum service life with the lowest possible energy consumption – and almost without any maintenance. The Flottweg Simp-Drive® regulates the differential speed according to the scroll torque. 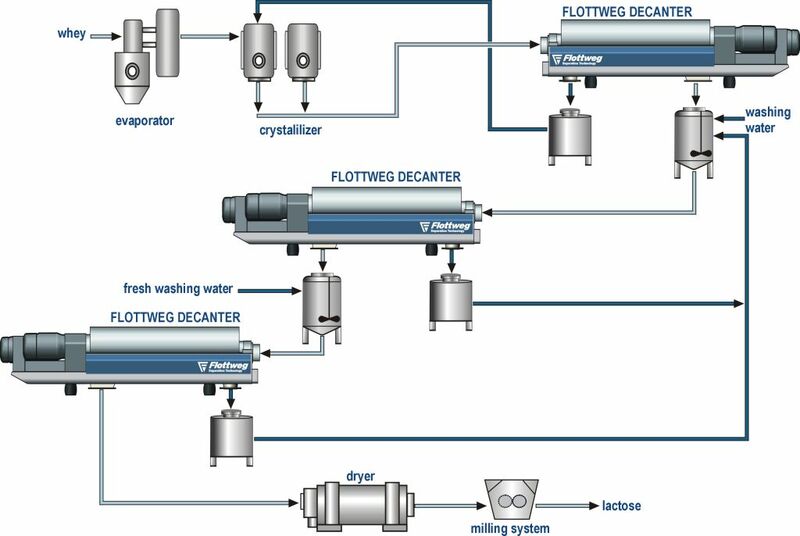 This means the Flottweg decanter automatically adapts to different load levels, and dewaters the casein or the lactose to achieve the maximum total dry solids in each case.